Portland, Maine ~ The Institute of Contemporary Art in conjunction with the Painting and MFA programs at Maine College of Art (MECA) is pleased to invite the public to attend On Genre: A Painting Symposium, a daylong series of conversations about the power of painting and the idea of genre as a cultural structure — one that guides interpretation, anticipation and imagination. This unique community gathering will spotlight and examine the exhibition American Genre: Contemporary Painting, curated by Michelle Grabner, Crown Family Professor of Art at the School of the Art Institute of Chicago. Nationally and internationally recognized presenters will be joined by an engaged group of artists, arts leaders and students to share perspectives about still life, landscape and portraiture as categories that chart historical continuity and reveal American value systems. A rich opportunity for extended discussion, Grabners’ exhibition is compelling and approachable, and yields great potential for interpretation and reflection on painting and genre as spaces of agreement. The morning session will begin with a brief overview by Michelle Grabner, followed a keynote lecture entitled Contemporary Genre Painting: Animating the Intimate by Marie Shurkus, Ph.D, Chair of Academic Studies and Professor of Art History at MECA. Drawing insight from the feminist tenet that the personal is political, this talk will analyze how contemporary genre paintings invite audiences to participate in an imaginary realm that activates real consequences. An afternoon panel discussion, Painting as Common Ground, led by Barry Schwabsky, American poet and the art critic for The Nation (the oldest continuously published weekly magazine in the United States), will explore genre and painting as systems that organize, interpret, translate and imagine history and experience. 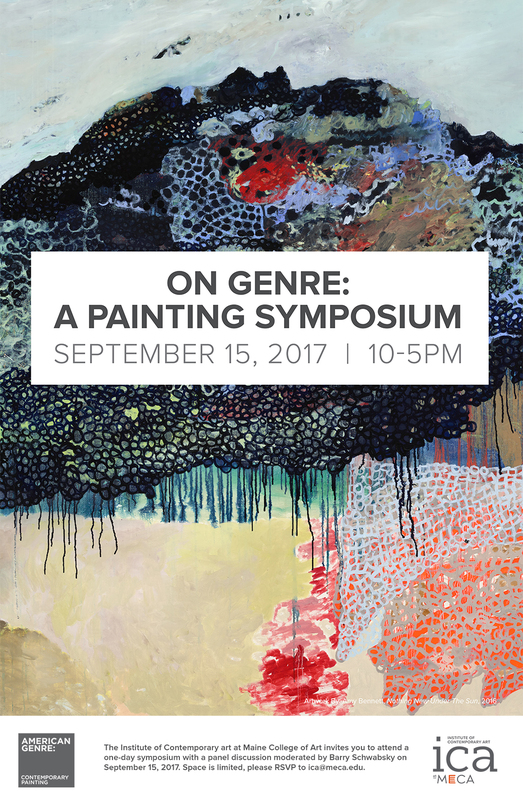 In response to Michelle Grabner’s curatorial focus, five panelists Sharon Butler, Angela Dufresne, Shara Hughes, Chris Stiegler and Roger White will share a variety of perspectives and insights about contemporary painting and illuminate the role of genre as a ubiquitous frame of reference. A community event intended to foster cultural dialogue, audience members will be encouraged to take part in an extended question and answer period following the presentation. On Genre: A Painting Symposium will end with a closing reception in the ICA. For more information, please contact Erin Hutton, Director of Exhibitions and Special Projects, Institute of Contemporary Art (ICA) at Maine College of Art at 207.699.5025 or ica@meca.edu . This event is free and open to the public. Due to limited seating, RSVP to the September 15th Symposium by emailing ica@meca.edu.